Studio 2 - Making Bristol Shine. When your display graphics look great, so do you! 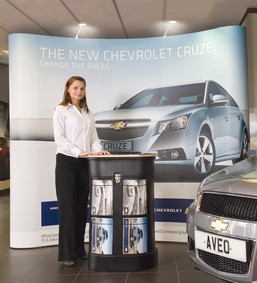 If someone asks you to create some banners, an exhibition stand, large display graphics, or a set of vehicle wraps, it’s pressure. Because there are always tricky decisions to be made, the budget’s tight and it’s all wanted yesterday. Whether you are a designer taking a brief from a client, or an employee being given the task by a boss, it’s stressful. Not only do you have to come up with something that wows everybody – you also have to deliver it on time, on the money, whilst avoiding a mental breakdown! We don’t just give you helpful advice and the service you need - we take away the stress. Because no matter how tough the challenges, we won’t let you down. Ever. We welcome you to visit our print & production facility in Bristol where we can offer friendly, helpful advice. Honda's stand is looking great for Goodwood! "It is great to have that working relationship that is intuitive and precise. A mutual feeling of comfort and support. A knowing that once briefed the job will get done to ours and clients satisfaction. That is why we use Studio 2 time and time again for prestigious projects such as Goodwood Festival of Speed. Because we retain our clients through good working relationships with our support partners (suppliers)"